When cold-blooded animals are exposed to a cold environment, their metabolisms slow and they live longer. When warm-blooded animals are exposed to a cold environment, their metabolisms speed up (to maintain body temperature) and they live longer. In a new study from University of Michigan, both responses are traced to a common genetic mechanism that senses the temperature and signals a slower rate of aging. This adds to a mountain of evidence that animals life spans are fixed by genetic choice, and not by any kind of passive physical deterioration. In 1986, John Holloszy of Washington University immersed his lab rats in shallow, cool water for four hours each day. They burned so many extra calories that they ate half again as much as control rats, but weighed less. The cold rats lived 10% longer, on average. Holloszy framed his report on this experiment not as a hormetic effect of cold exposure, but as a refutation of the “rate of living” hypothesis. In 2006, Gordon Lithgow of the Buck Institute for Aging Research exposed lab worms to repeated heat shocks, and they lived 10-20% longer. Lithgow’s group noted that in response to the treatments the worms generated a surge of a protective hormone dubbed heat shock protein, and that heat shock protein also increases life span. They matter-of-factly reported their results as an example of hormesis, demonstrating that between 1986 and 2006, the concept of hormesis had worked its way into the field and become commonly integrated into gerontologists’ thought process. Hormesis is the name for the paradoxical adaptation that makes animals live longer when they are exposed to challenges and hardships. Starvation, various toxins in low doses, infections, heat and cold can all lead to a longer life . These are not merely quirks of the physiology, but deep and ancient adaptations for the purpose of stabilizing population. The population death rate, like everything else about life, is homeostatic. That means that when something in the environment – perhaps a famine or an epidemic – is killing off part of the population, the rest of the population responds by toughening up and living longer. At the individual level, this is manifested as a slow-down of the aging process when starvation or other hardship is sensed. The response is managed by a logic system that works very much like a computer, but it is based on a web of hormones and chemical signals, in addition to neural circuits. The new study, announced last week at the high-profile annual meeting of AAAS, also claimed to discredit the “rate of living” theory. In fact, a quick literature search reveals that this theory was discredited in 1956, in 1986, in 1989, again in 2002, in 2004, in 2007, and in 2009. In fact, August Weismann clearly saw through it in the 19th Century, thirty years before the eponymous book by Raymond Pearl proposed that faster metabolism leads to faster aging. In my most frequently cited academic publication, I, too, have railed against “rate of living”. You don’t even have to know that bats burn 3 times as many calories as mice and live 10 times as long; the simple fact that sedentary people die early while athletes enjoy enhanced longevity would banish the idea that our bodies become damaged from use and simply wear out over time. This serial error comes from misunderstanding the Second Law of Thermodynamics. The Second Law says that entropy must increase in any closed system. This is indeed related to the reason that washing machine bearings wear out after a few years. But living things are not closed systems. They take in free energy from food or sunlight and dump their waste entropy back into the environment. The ability to do this is not a technicality; it is a fair definition of what life is, what distinguishes living from non-living things. All of life is an end run around the Second Law, and this is what enables us to grow and to learn, to increase in complexity. There is no physical requirement that living things should deteriorate over time – else how could we ever grow up? The UMich study, published in Cell last week just as it was announced at AAAS, starts with an examination of genetics and cold treatment in the lab worm, C elegans. Worms that are kept at lower temperatures live longer than worms kept at higher temperatures. No surprise there – here is a reference from 1908. Temperature modifications in both directions have been observed to increase life span of cold-blooded animals, and, to a lesser extent, mammals as well. The news is about discovery of the means by which worms adjust to colder temperature in order to lengthen life span. In particular, Xu’s lab discovered that the gene called TRPA-1 is necessary for the life-extending signals to find their mark. When TRPA-1 is knocked out of the worm’s genome, life spans is actually shortened in response to cold. Another gene necessary for life extension from cold temperature is the famous DAF-16, which was identified a dozen years back as the Grand Central Terminal of anti-aging signals in worms. The Xu study goes on to relate the mammalian response to cold (Holloszy’s experiment above) to life extension in worms. That same TRPA-1 gene has a homolog in mammals that serves a similar function. Exposed to cold, mammals do a good job of keeping their core body temperatures steady in a cold environment by burning more fat, by shivering and by increased activity. That they live longer nonetheless demonstrates that their life extension is not a consequence of physiology but a choice made through hormonal signaling. He notes that the same gene, TRPA-1 that is activated by cold in worms and mammals can also be triggered by eating Japanese horseradish (wasabi). Visually, you can see a downward trend. Regression analysis gives R2=0.21, significant at p<0.001. The outliers in the upper right are Arizona and California, which have high incomes and warm Januaries. I suspected that these results were too good to be true, because there’s a powerful relationship between income and longevity. Some of the poorest states happen to be in the American Southeast, where temperatures are warm. 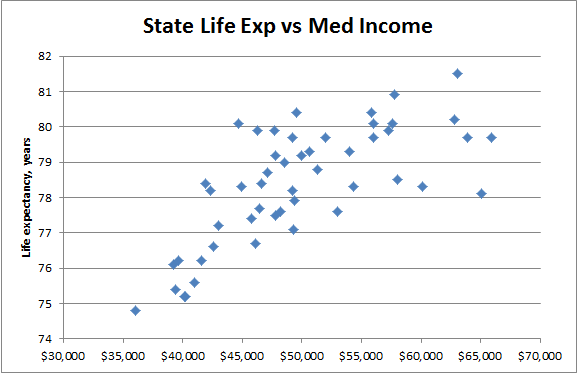 To correct for this, I found (also in Wikipedia) figures for median family income by state, and sure enough life expectancy had a much stronger relationship to income than to temperature (R2=0.49, p<2*10-8). 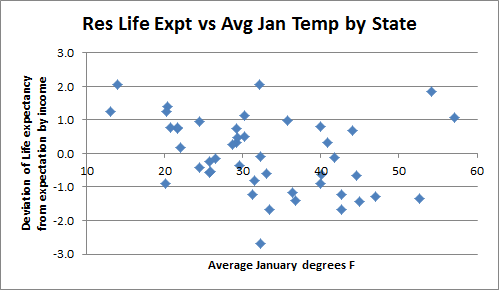 After removing the effect of income, I plotted the residual variation in life expectancy against January temperature, and lo and behold, results were a bit more significant than the relationship for raw life expectancy (R2=0.16, p<1*10-5). Despite the direct simplicity of the comparison and the impressive statistical significance, I would not claim that this proves anything about a response to cold in human longevity. It may be that this is an artifact of the way life span is reported, or a reflection of the fact that Americans like to retire to warmer climates. These and other hypotheses need to be explored. This is what makes science complicated (and epidemiology fraught with contradiction). We might begin our skepticism by comparing Northern and Southern Europe. Scandinavia has much higher incomes but slightly shorter life spans than the Mediterranean. So my longevity advice for the day is to enjoy a walk in the bracing air while we’ve still got some winter left, and come back in to plateful of sushi with extra horseradish. Fun blog, Josh! Nicely done! Sorry but where is there any “science” in this? Science is about exploring the reason behind things. Shuffling numbers that may or may not show anything at all for a whole day gets no one anywhere. Nevertheless it seems to be the one standard thing a “scientist” does nowadays. Right now I could list at least fifty factors that significantly contribute to a persons life expextancy and that are very different in many countries (or heck even US states). We should much rather focus on identifiying the underlying chemical causes of what exactly happens in the body and how it influences the living organism. Concerning your first point: Scientific study may teach us ways to manipulate a system even before we understand it fully. There are many herbal medicines that were used for thousands of years without any knowledge how they produce their benefit. And to your second point: I agree. The science of life extension should be better funded, and we should be doing all these things. Nevertheless thanks for your posts… this blog is a really good ressource about life extension science. I just stumbled onto this post while researching the effects of cold on weight loss. I realize this is years old, but I figured I’d shoot in the dark: Could I suggest looking at longevity in regions that are cool enough to produce mild cold stress, but not so cold that the inhabitants would just bundle up? Scandinavians aren’t usually trouncing around in the cold in T-shirts, but folks where the average daytime temperature is 60 Fahrenheit probably are. Sure. To be more specific, we could compare a list of countries, plot life expectancy vs average winter temperature, control for median household income and perhaps a few other variables (smoking? BMI?). If you will collect the numbers, I will do the statistical analysis. Shouldn’t you have corrected the data using the average income of the largest city? Your data sets don’t otherwise match for appropriate comparison. HGH works, but only if you’re under 18. There is some evidence for longer life span in a colder climate. After watching http://videos.med.wisc.edu/videos/1691 I suggest the colder air temperature increases the ability of virus replication and therefore, people living in warm climates suffer fewer respiratory illnesses. I wanted to add the average age in the city should be higher in milder climates, because of people who moved there in their older age to escape extreme cold lifestyles. I’m late to the game here since I’m gradually working my way through these posts…however on this topic, it seems to me that it would be almost impossible to disentangle the impact of more or less sun exposure from temperature using the approach described here. From what I know of the evidence, a moderate amount of frequent mid-day sun exposure seems to be one of the most important health-promoting behaviors. This is also another of many things which is often misrepresented about the characteristics of the true “Mediterranean” diet. In the method shown in this post, people getting higher temperatures would also likely be getting more sun exposure which would likely counteract any negative impact of warmer temperatures if there was one, or could account for a benefits seen with warmer temperatures. 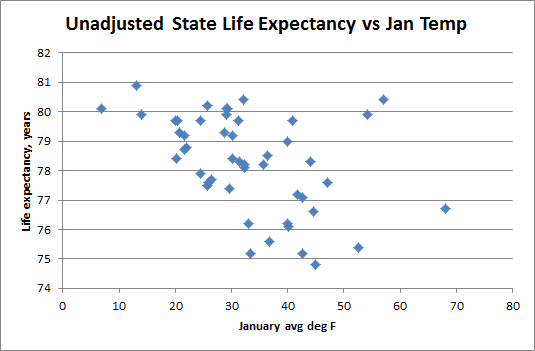 Climate control pretty much renders the correlation (or lack thereof) between geography and lifespan irrelevant. It’s not as if Scandinavians spend most of their lives shivering their asses off. Most people are indoors most of the time. And most of us keep offices, homes, and schools at comfortable temperatures.